I'm fascinated with Nikola Telsa. The more I read about him or learn about him the more amazing he becomes. 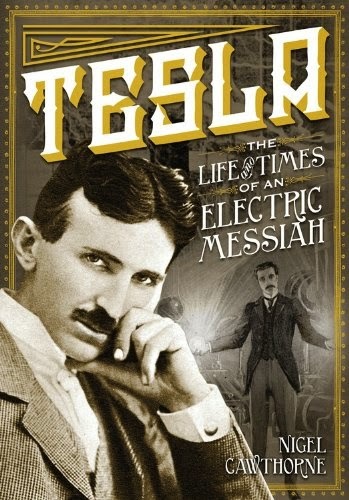 This week while book trolling, I found a book called Tesla The Life and Times of an Electric Messiah by Nigel Cawthorne. It's a picture biography, more coffee table book than true biography, but that isn't important. What is important are the huge numbers of photos and illustrations of his inventions. I picked up the book mainly as a source of inspiration for my next steampunk project. And that is the reason I'm sharing this with you, as a potential source of inspiration. The book talks about his inventions, his theories, and those created by others. 19th Century Science is at your finger tips with this book! Well, at least the general idea of it, not the specifics of it. IF you are into Steampunk, then you'll want to check out this book for the same reasons I did. I can't vouch for how good of a biography it is, because I've not yet read it. But I have glanced through the pages and enjoyed many of the photos and illustrations. Click the link above and buy it from Amazon. I got mine through Books A Million and actually paid a little more than Amazon. But it's worth it!